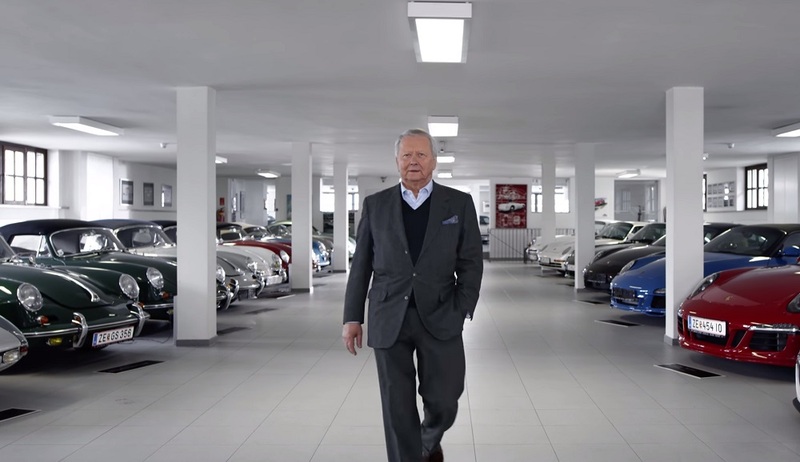 In Porsche's most recent Top 5, the final video of season 2, Wolfgang Porsche himself is on screen to talk about the cars from his collection that resonate most with his sensibilities. Like the rest of his family, he's a sensible German man with a fun side. He likes to enjoy the finer things in life, like a pair of string-back driving gloves and a gorgeous wood Nardi steering wheel. That's not to say he doesn't also like the modern accouterments available in a modern car. It's also clear that he appreciates a good color, and has a specific color palette that he will choose his cars from. In the case of the Porsches here, Irish Green represents the color his father loved and passed down to him, and Stone Grey or Chalk are similarly wild and demure tones at the same time. A solid choice, and often referred to as the best of the aircooled line. The Turbo S was slightly more adorned than a traditional 911 shape, but it pulled off that look so well. This is where that Family Green comes into play. A GT Silver car, as all proper Carrera GT should be. This wild child of a car makes up for the fact that none of Herr Wolfgang's favorites are GT3s. Any Porsche with a 917-aping wood shift knob and a screaming V10 is okay in our book. We've not seen a Panamera painted in Chalk yet, but Chalk is such a gorgeous shade that we can't imagine it would look bad. This is Porsche's most technologically advanced car in history, so it's not really a surprise it made this list. Stone Grey is quite similar to that Chalk of the car previous, but the flanks of this Porsche are a lot smaller than those of the Panamera. The America Roadster, with it's hand-hammered aluminum bodywork, weighed in with a scant 605 kilogram curb weight (just 1330 pounds), and was produced specifically for the gentleman racers of Southern California. This is an incredibly rare bird, and we love it dearly. Again, it's not a surprise to see anything with a Fuhrmann 4-cam engine on this list. Wolfgang has good taste here, and this Irish Green late 356 Carrera is exquisite. Porsche will be back with more Top 5 videos in the far off future, but for now, you can watch the final episode of season 2 here below.